They say that it’s lucky if a bird poos on your head. Well how about if you stand in 4 different dog turds within a 24hour time period? The social etiquette of cleaning up after your dog is not an obligation we have observed in the states. To stand in 4 dog turds in one campsite is not just unlucky but quite disturbing. All of our footwear has very good grip. It’s not pleasant!  While on the topic of smelly business, I want to mention the ongoing saga of laundry. Those who know me well, know that I have something of a washing obsession. So I take the business of washing & drying clothes very seriously. And you have to know that we each have a very frugal selection of clothing. All them chosen for their quick-dry, low-odorous properties. It is impossible to accumulate a good pile of dirty washing while awaiting for the next Laundromat, as we would find ourselves within 3 days, riding naked. Risky business. So the plan initially was to wash our clothes in the shower at the end of everyday, hang them out before dinner, and voila, they would be dry and ready to pack after breakfast. The fault in this plan is of course, fog. Or mist or whatever you want to call it. We found it on the Washington coast, became well acquainted with it along the Oregon coast, and have since begrudgingly come to terms with it as weather synonymous with these parts (we must have missed that bit on the brochures). A friend we met on the road has titled the month ‘Fogust’ (thanks for that gem Fred). From Canadian weather around 30degrees everyday, to the USA coast where we have been riding in water proofs (loving our SealSkinz gloves) in temps of anywhere between 10-13degrees, this really is not the ‘summer time on the beach’ we expected. We both agreed never to come here in winter – brrr! We both secretly thought that by simply crossing the state border into California, the beach babes & tans would surely mean and end to this eternal fog, but no. And so the dirty clothes dilemma. Well, washing them is easy with our new beaut portable washing machine called “The Scrubba” (it really is called that* see below), but how to dry them in this eternal fog? If we leave them out over night, the morning mist ensures they are as soaked as if they had been left out in the rain. 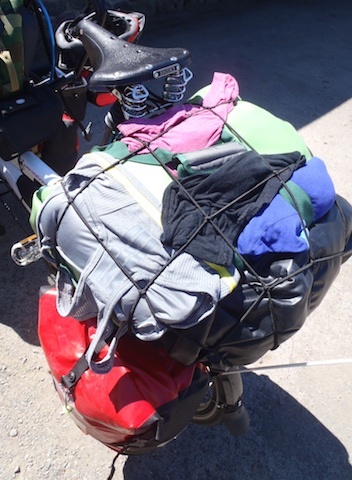 So there was really only one option left to try, hanging them strategically on the bike and letting the wind of our pedal powered journey dry the washing. This of course only works if there is not any moisture in the air, and we have often sported the unpleasant odor of ‘not quite dry’ laundry on several occasions. There are other risks too of course, and since loosing a favored Adidas sports top on the ride somewhere between Lake Quinalt and Iwaco, I have taken to securing ‘riding washing’ much more fastidiously. 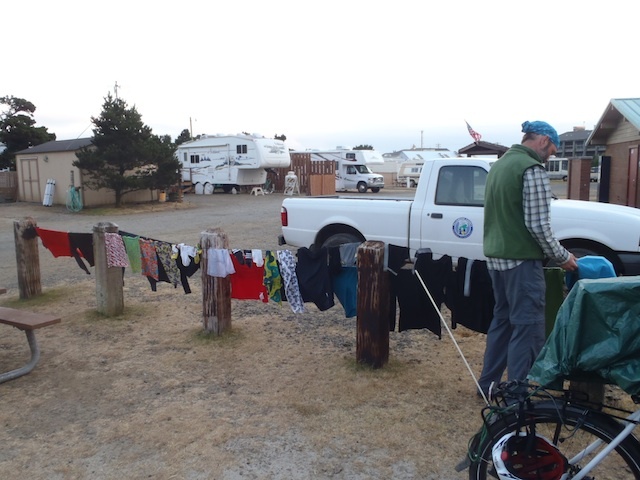 Needless to say that when we come across a campsite that has a washer &dryer, we get excited like someone was giving out free cake. 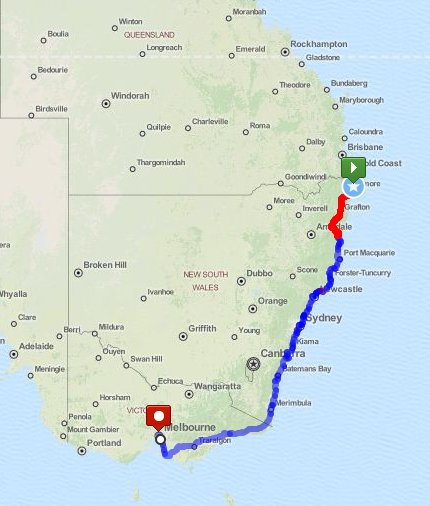 I was going to include some serious reflections and observations about our 1,894km ride so far, but have decided no, this is just one of those blogs straight from the top of my brain, where the details are injected at the whim of my fingers. So we have been enjoying some pretty spectacular days riding through the great Redwoods of California. Albeit in the cold fog. 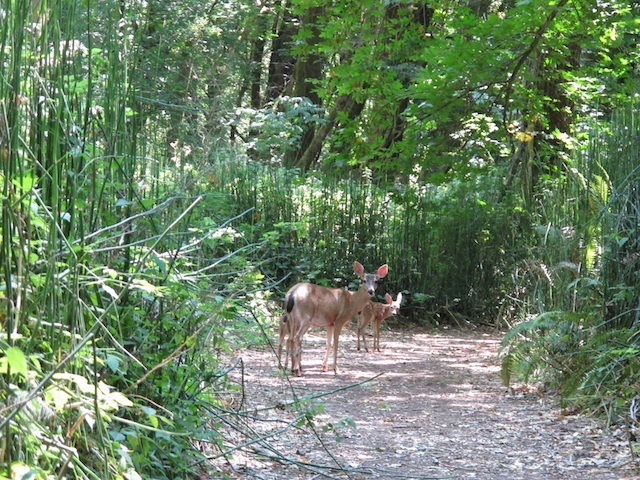 We have had some sneaky sightings of deer and their bambi-like fawns, some elk and lots of awesome birds and had a first-hand encounter with Smokey The Bear. As in, THE Smokey the Bear. Now you may or may not believe this, but it was his 69th birthday when we were staying in the Humboldt State Park. 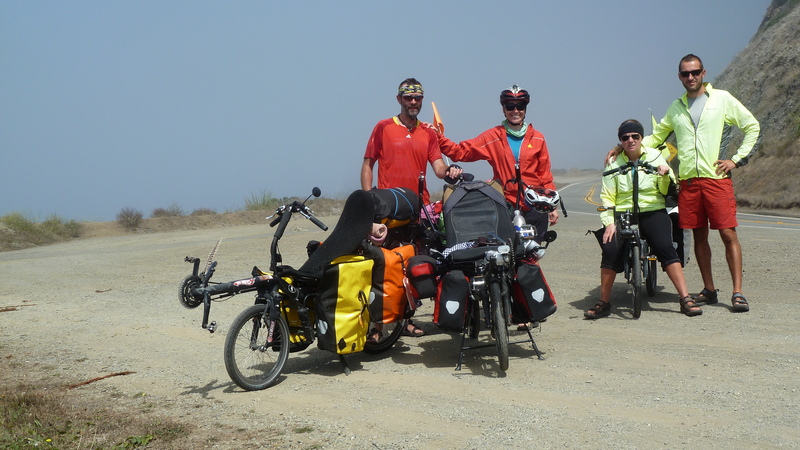 We were camping with a fantastic French couple, Fred & Ophelia, and had spent several days riding the same distances and staying at the same campsites each night. So we had been planning for several days to make it to a campsite where a store was ‘close by’ so that we could have, what Fred called, ‘a beer-party’. As with any event that has been in the planning stages for some time, we were quite excited when everything came together for it to unfold. 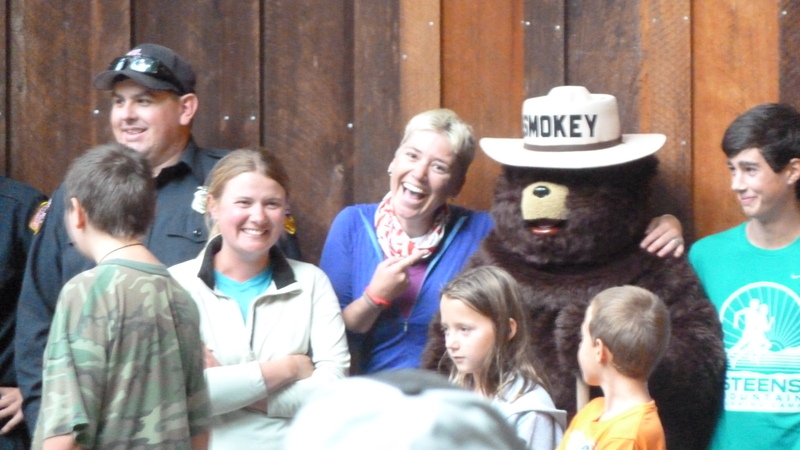 Imagine our surprise when we discovered that in coincided with Smokey The Bear’s 69th Birthday. Genius! And, wait for it, there would be free cake! So off we rolled around 2pm to the ‘convenience store located 6 km south of the campsite’ to fill up our panniers with party supplies. There are some truly remarkable microbreweries in these parts and many delights to sample. We had been told that Smokey’s party started at 7pm, so after enjoying our own party, we planned to arrive late and make a beeline for the cake table. But gee and golly, that Smokey sure loves a party. We got swept up in the campfire sing-a-longs & the choreography involved in every verse. Naturally, there were loads of children up on stage enjoying the pantomime atmosphere and some kind of ‘junior ranger’ induction ceremony. All very family-friendly. And then, while we were studying the chorus to Smokey’s very own song, he arrived on a fire truck. Talk about a riot! Ophelia got carried away with the hub-ub and before I knew what was happening, the 2 of us were up on stage standing right beside Smokey (the only people over 12 years old, aside from Smokey & the firemen), and pledging our dedication to stamping our forest fires while being sworn in as Junior Rangers. We even got shiny silver-star badges, and I got to give Smokey a high-5. It was quite the moment. (And for those of you who will ask, no I did not get the chance to wear his hat as it was securely sewn into his head). It’s quite astounding how many other cyclists we have met on the road. Its funny cos when we stroll into a cafe or rock into a campsite, we will usually meet another cyclist or 2, and it’s kinda like being famous. “Hey, you are those 2 Aussies we heard about! Some people from the last campsite were telling us about your journey”. Sometimes, we feel a little bit famous. Or is that infamous? So I will finish with a quick TotallyTandem forecast, but first have to share with you a remarkable feat from Bremma town. We found an awesome swimming hole at the Standish Hickey State Park, and had heard about a huge 50metre cliff jump. Of course Brendon was straight up the cliff, so naturally I whipped out the camera. He took some time to prepare himself while standing out on that ledge, and I was filming the whole time to make sure I wouldn’t miss it. Then I thought, well, I am going to have to edit this before I can put it on the website, so I will quickly stop recording, and start again. In the time it took me to press stop, he leapt off the edge. This is not my finest moment of capturing something incredible on video. Bren’s cliff jump from TotallyTandem on Vimeo. But I am sure you can imagine the splash and celebratory whooping at the end, and you have to agree, it was a very brave and awesome plunge. And finally, the TotallyTandem forecast. The Bremmarathon, as we call it, to get to San Francisco on 20th August is well into its final stages. 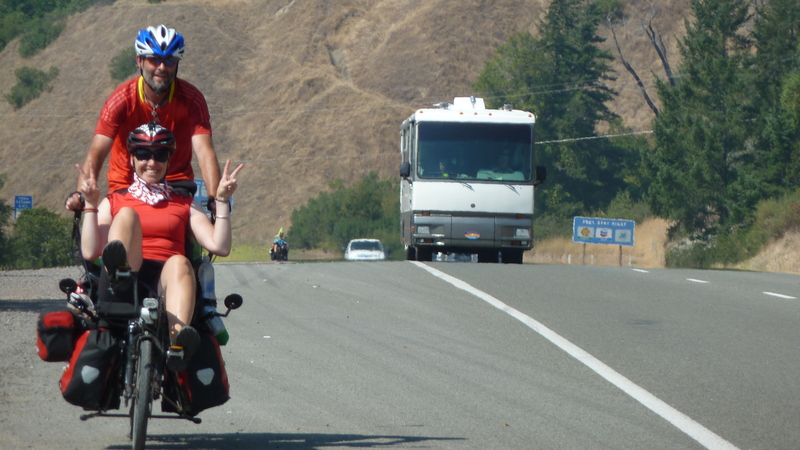 We hope to hit our 2000th km while riding into San Fran. We will spend 3 days in town gathering bits & pieces to prepare for The Burning Man Festival, and meet our Aussie mates in Reno on 23rd to head into the festival with them. We will spend 9 days camping in the desert catching up with excellent mates, then we will spend a well-deserved weeklong break in Lake Tahoe with brother Michael (yippeee). During this ‘break ‘we plan to cycle around the entire Lake, hire mountain bikes to ride the Flume trail and get a car to drive to Yosemite Park. After that, we make our way to Sacramento for a full Falkor service (a few issues have presented themselves and a few bits need replacing), then back to San Fran to stay with some more mates before hitting LA. There are whisperings of hiring a car to drive to the Grand Canyon (I desperately wanna go but its too hot this time of year to cycle up there) so we will see what happens there. Our USA visas expire on Oct 18th, so we have to make our way to the Mexico border before then. Can you believe we left Japan only 7 weeks ago? *At the exact time of writing this, Brendon experienced a major malfunction with The Scrubba and there is now another letter to be written. A full time job I tells ya! Hey brem, laughed a lot re washing problems, the photo with the bear you look spookily a lot like me…blonde, smile……do do do!! Ha! It’s all about washing! Love that you see the Davis genes in my pic with Ole Smokey. I have shaved my head now so I wonder if you still see the resemblance? Great to get some tales from the road. Makes me want to get back on the bike. I finished my trip in Portland (6300km) then flew home and am now in Patagonia doing some work. 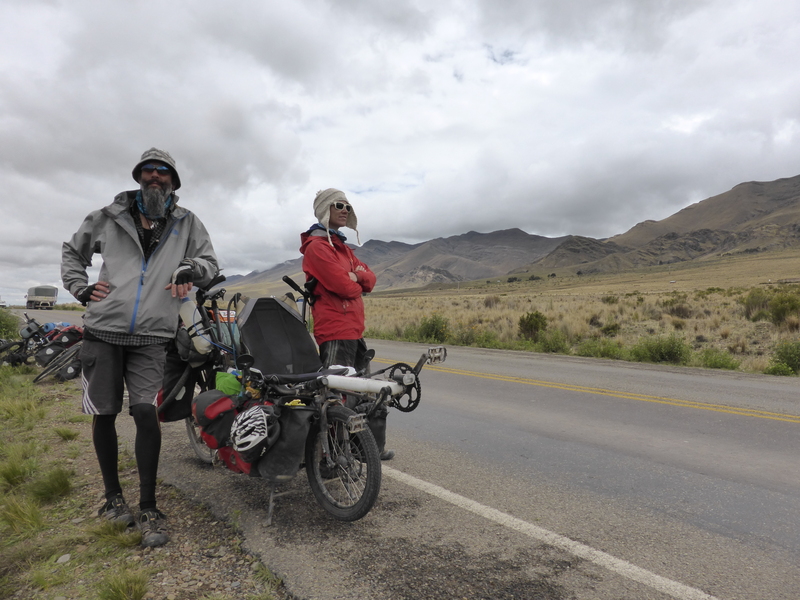 If you forget to stop in Santiago, make sure you drop by our camp in Patagonia….I’ll be here for a while. 1-2 years. It’s a bit blowy down in these parts so would,’t be much fun on a pushy. 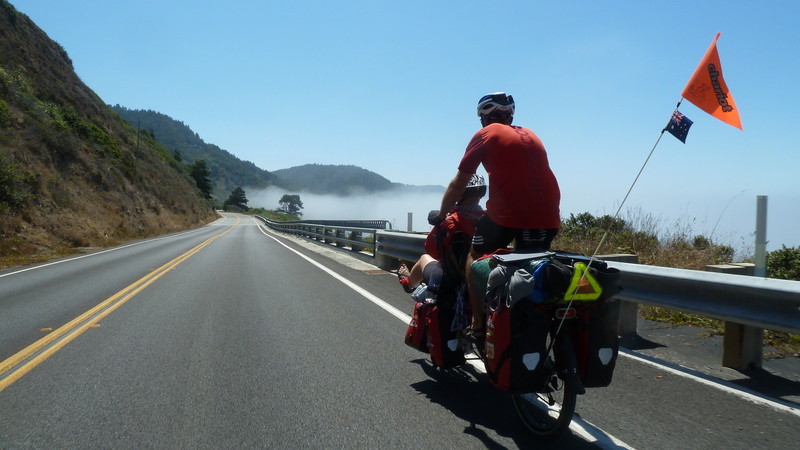 Doug the Kiwi….met on the Oregon-California border. G’day Doug the Kiwi! Thanks for getting in touch! Congrats on your huge bike trip! Totally Epic man! You were on fire pushing out those huge km days! We salute you! As for Patagonia, it’s defo on the radar. Stay in touch, if we make it down that far, we will for sure look you up. Perhaps we should hook up some sails to maximise the wind power?